It’s summer clearance sales time, and I know you are rubbing your hands together in eager anticipation of all the great deals you are going to find. I know the routine, you plan your shopping day, pack your tote, add some water, and off you go. But when you get there, the sheer number of overcrowded, disorganized racks is daunting. 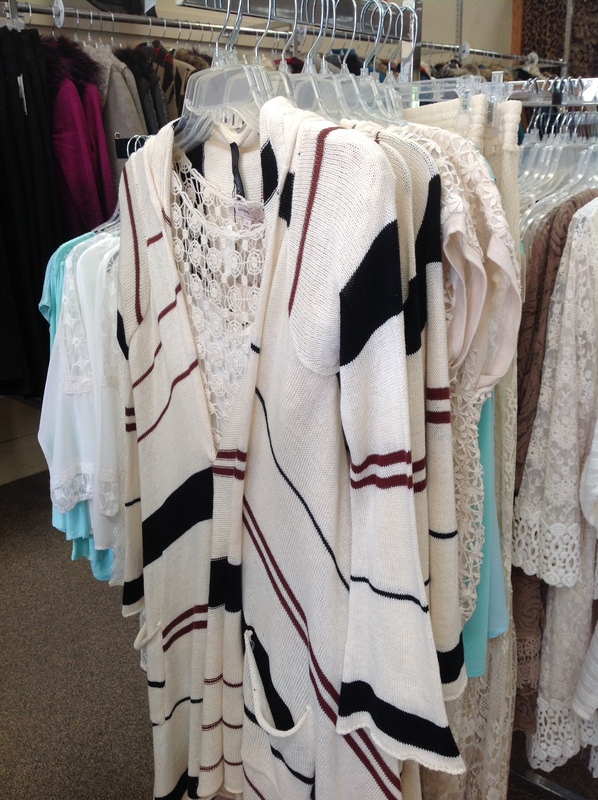 With clothes on the floor and draped over the racks, sales shopping has quickly become way too much work. Does this sound like you? Have a list: When you head out with nothing in your brain except scoring on some cheap prices, you end up buying items that, while they may be cheap, really don’t fit in your wardrobe. Just because it’s cheap, doesn’t mean you should buy it. The most expensive items in your closet are the cheap ones that you never wear! Try everything on: Take it from me, if it is on the sale rack, there is a reason. The best items are there because they were just too expensive to begin with. These are the real steals. But many items are there because there was a fit issue. If you see 6 of one style on the sale rack, avoid it like the plague. That is a true indication there is a problem with that style. The best sales items will have only 1 or 2 left. Shop early: Get there first. The best of the best sell right away. Don’t wait until the racks have been decimated by all the shoppers before you go! Shop alone: Friends are awesome, but they are not always helpful when you are shopping. We all have a bias towards what we like, and so often I see friends and family imposing their personal tastes on others to the detriment of the shopper. Meet your friends or family for lunch after your shopping is finished and brag about all your great finds! Read your emails: I know, I know… I am bad about this too. (I just love the gmail app that puts all the promo emails in a separate folder so I don’t have to see them!) But, at the end of the day, your favorite stores communicate with you primarily via email. If you want to get a jump on the sales, you have to read those emails. As an example, all of the people on our email list are getting an email Thursday morning announcing our SECRET VIP PRE-CRAZY DAYS SALE! If they aren’t engaged in email or on social media, they will miss out on this EPIC sale! Following these 6 tips should make sale shopping really beneficial to you and not overwhelming and exhausting. It’s a great time to take advantage of discounted prices and round out your summer wardrobe. If you are a sales shopper, be sure to join us for Crazy Days this Friday and Saturday! I’m loving the layering trend with jewelry right now. We have just picked up two new jewelry lines for Fashion Crossroads that have made this an art form. Zacasha necklaces combine delicate crystals and beads with colorful tassels and charms. I was blessed to get to meet the designer of Zacasha at market just a few months ago. Indeed, this is one of my favorite things about attending market in Las Vegas at the Magic Apparel Show. It is not uncommon to have the designer help you buy the line. In her decidedly French way, and using lots of hand gestures, Jennifer Belcourt recalled the story of how she came up with the line and how it has grown over the years. After having traveled throughout Asia, she settled in Bali. She used the traditional Balinese tassel necklace as her inspiration and began to mix techniques and materials from the various islands she had visited. 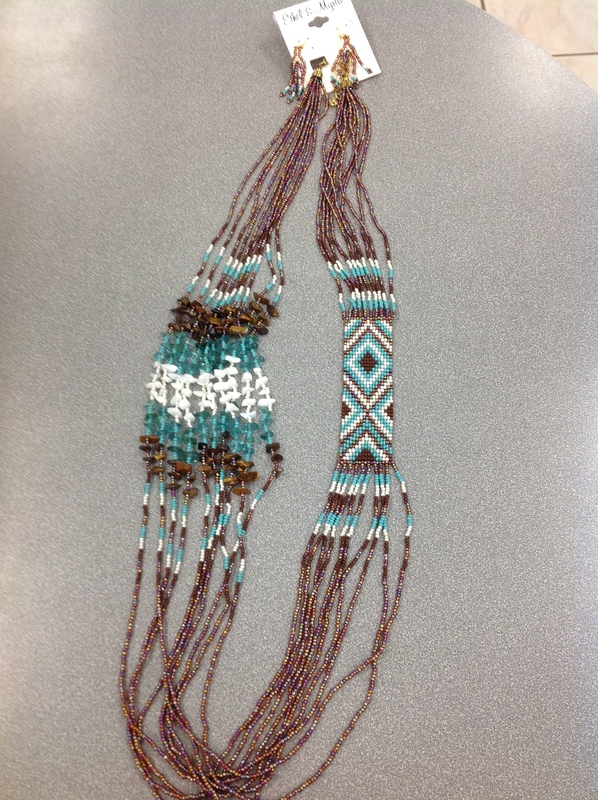 and example of this is described on her website: “The island of Madura’s specialty, is necklaces with tiny knotting between each bead. Using this technique Jennifer designed necklaces made of crystals, Mala beads, fresh water pearls from the island of Lombok and lava stone beads from the volcanoes of Mt Batur in Bali and Mt Semeru in Java”(http://www.zacasha.com/#!our-story/cast). Her necklaces symbolize good luck, peace and respect for the planet. I am always amazed with someone who can take an idea and turn it into a company. I am always heartened, when that person is a woman! As a buyer, I am always attracted to companies that support impoverished areas in the manufacture of their product. Jennifer’s necklaces are not made in factories but by Indonesian artisans who traditionally work from their home and in this way provide for their families. 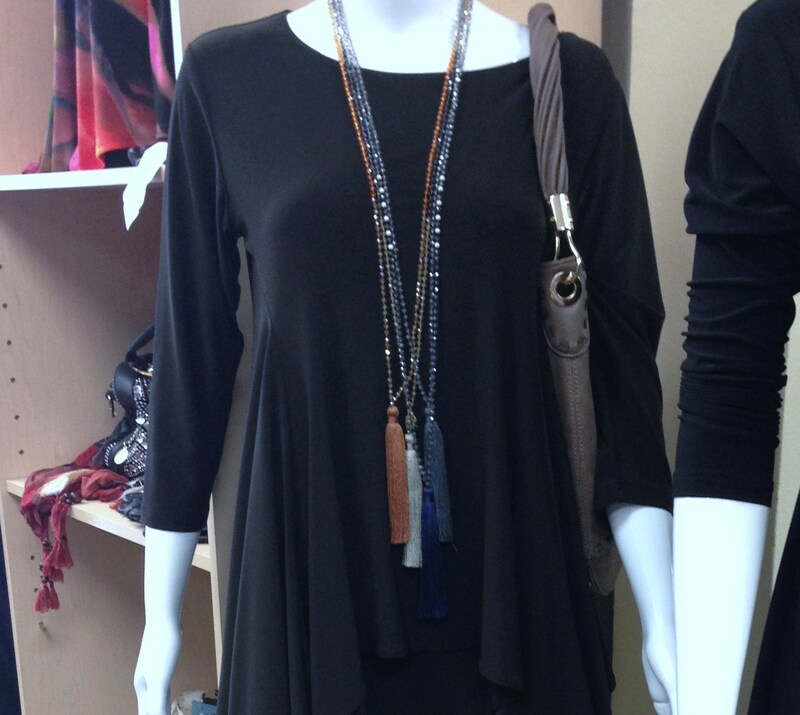 Zacasha is a tassel necklace line designed to be layered. Indeed, the more you add together, the better they look. 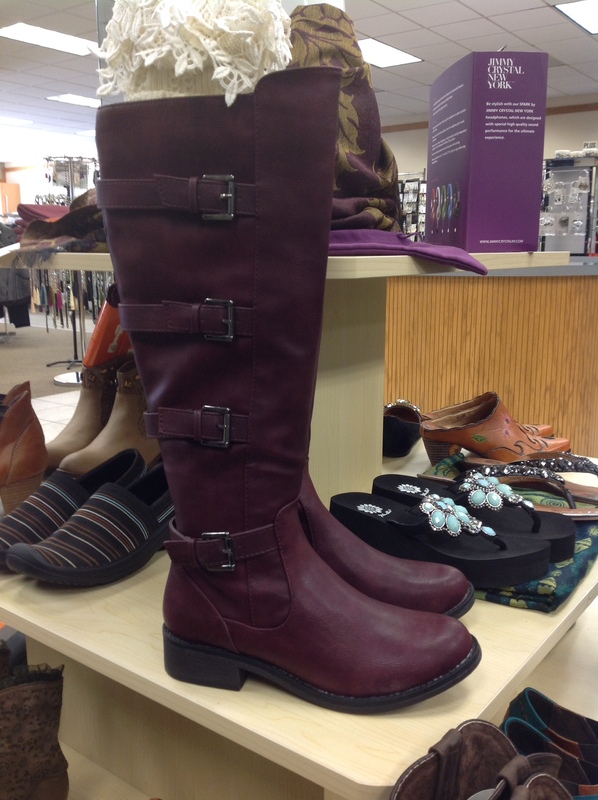 They are perfectly designed to wear with today’s tunic style tops and blouses and a whole lot of fun. Be careful, however, you just might catch yourself playing with the tassels in an absent minded moment. They are quite soft! Another new line that is also designed to be layered is Bourbon and Boweties. 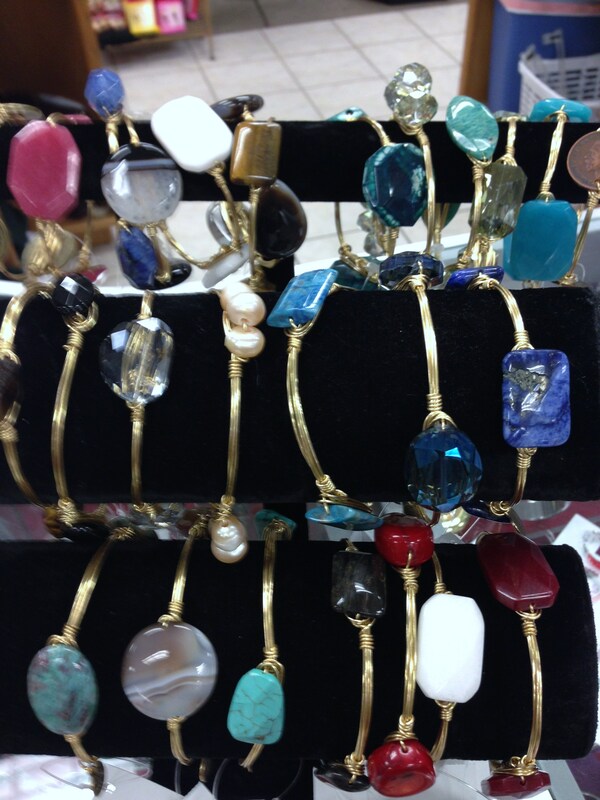 These beautiful bracelets use semi precious stones as well as agates, lava stones, polished coral, and many others. The stones are wrapped in gold plated wire for a artistic and unique look. 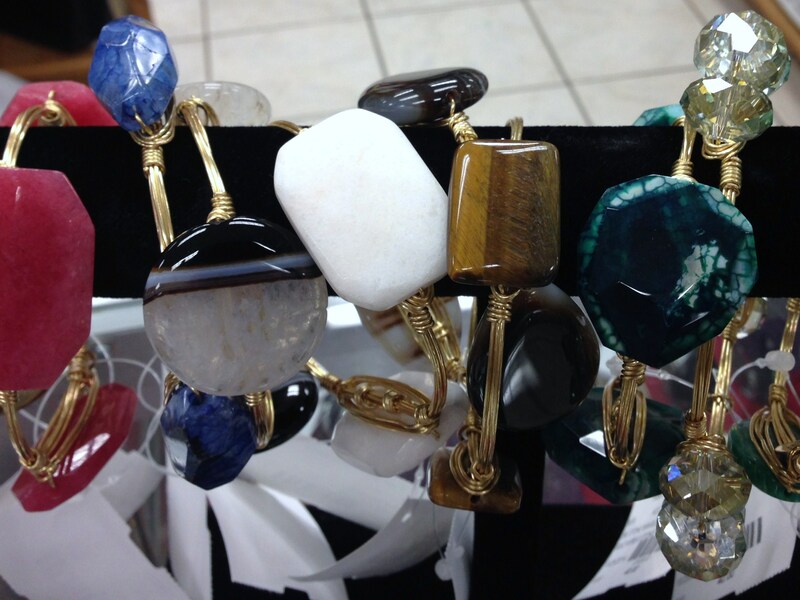 Each bracelet is as distinctive as the stones in the design. Like Zacasha necklaces, these bracelets look better together. Bourbon and Bowetie bracelets are hand made by proud southern ladies! And you know, that makes me think….we women are better together too. So, when you embrace this jewelry trend this season, let it remind you to appreciate your girl friends and how each of you is unique and yet even more beautiful together. Don’t Put Too Much Stock in Your Friend’s Fashion Advice. I know that shopping is more fun with friends! It is for me too, but choose your shopping friends carefully. I can't tell you how many times I have seen a customer not get something that she really liked and looked good in because her "friend" told her not to buy it. Worst of all, I have often suspected that the reason behind the friend's advice was more about her than what was really good for the friend she was advising. Here's the thing – clothing is extremely personal. It is an expression of who we are as people – our personalities, our jobs, our lifestyles. What you need is often times not what your friend needs. What styles and colors that look good on you may not be the same styles and colors your friend likes. What you are willing to spend on clothing may be more or less than what your friend is willing to spend. I know it's scary to trust a sales person's opinion; there is always a fear that he or she will tell you it looks good just to make the sale. I'm sure there are those who do that. However, if you find a great store with a great sales person that will give you an honest opinion, in many ways they are better able to be objective than a friend might be. This is because they have no pre-conceived opinion of you. They will likely suggest things that might get you outside of your box because they aren't automatically rejecting things based upon what you usually wear. If they are worth their salt as a sales person, they will realize that it is far more important to help you pick fabulous things and have you come back than to make a one time sale. If you find you just can't put your faith in a stranger, then take my advice and choose your shopping partner wisely. Will they be able to tell you what looks good on you and leave their personal tastes out of it? Will they not judge you if you spend more or less than they do on clothing? Is their motivation truely to be a help to you or do they enjoy feeling like "the expert?" When you listen to them, do you get compliments from others on how you look? These are just some of the questions you might consider asking yourself before you go on your next shopping date with your friends. Happy shopping!